Inc (JAPAN). We also provides consulting services for skincare. Products range from Skin Care Cosmetics, Make Up Cosmetics, Hair Care & etc. 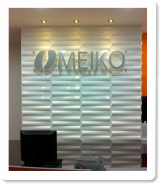 Meiko achieved certification of ISO14001 for tackling the environmental problem.